The budget model Schwinn 120 upright exercise bike is for basic workouts as a way to get convenient low-impact cardio exercise at home. The LCD display features Time, Distance, Pulse, Watts, Speed, Calories, and Resistance. 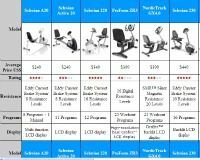 The workout programs include 1 Manual and 8 Profile, along with 16 resistance levels. The mileage counter is switchable to kilometers. The console does not have an on/off switch; the automatic shut-off will occur if there is no activity for 5 minutes. UPDATE: The 120 upright bike is no longer available. Check out the popular 130 replacement model here. The extremely quiet Schwinn 120 upright bike has a perimeter-weighted flywheel as part of its BioDyne™ Performance system. It has a magnetic eddy current brake (ECB) system, a fully shrouded flywheel, integrated heart rate sensors on the handlebars, a built-in magazine rack, and an AC adapter (included). The weight limit is 275 pounds. Other features include Schwinn’s BioFit™ Comfort system which consists of an ergonomic pedal designed with a 1-degree tilt to align your hip, knee, and ankle for proper pedaling stance and comfort, and adjustability in the seat height, handlebars, and console (tilt). 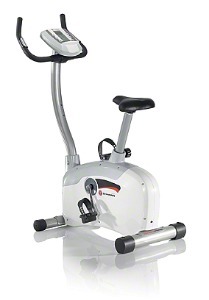 These exercise bikes are considered to be a good value for the low price. While they are not designed for heavy use, they are an affordable solution to get low-impact cardio workouts daily or several times a week. Other than the fact that the seat is uncomfortable, there are no big cons to the Schwinn 120 upright exercise bike that sells for $279. The seat post is standard so you can switch out the seat to something with more padding, or buy a gel cover, although it is a bother to buy a new bike and have to purchase items to make it useable. 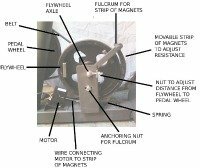 For just a few dollars more, upgrade to the Schwinn 140 with a larger flywheel and saddle, fore/aft seat adjustments, and more programs.